INDIANAPOLIS — Your pets are your family, and when you take your dogs and cats to the vet, you expect they will be treated with great care from a licensed professional. But, Call 6 Investigates found that’s not always the case. The Indiana Attorney General’s office has filed half a dozen cease and desist complaints over the past two years to people accused of practicing veterinary medicine without a license. Call 6 Investigates tracked down some of them to find out what happened, and our Kara Kenney dug into how you can protect your own pet. Kim Chambers, a volunteer with Helping Paws Rescue, took her foster dog Candy to the Pet Vaccination Clinic on West Washington Street in 2014 for spay surgery. Monica North also had a bad experience at the same clinic, where she took three foster dogs in for dental care in 2014, including extractions. North said the staff told her “Dr. BJ” had done the work. Dr. Branislav Jordanovic, also known as “Dr. BJ,” started the Pet Vaccination as a mobile clinic in 2002 and opened the stationary clinic on West Washington in 2013, state records show. “I called the licensing board and they said ‘no, he’s not licensed,’” North said. Both North and Chambers filed complaints in 2014 with the Indiana Attorney General’s Office, the state agency that investigates allegations of unlicensed medical practice. In 2016, the Indiana Attorney General’s Office launched a cease and desist case against Jordanovic, saying he’s performed spay surgeries and dental procedures without a license. “(Jordanovic) represents himself as engaged in the practice of veterinary medicine, by representing himself as ‘Dr. BJ”’,” read the state’s motion filed in April 2016. The Attorney General also pointed out Jordanovic has been enrolled in a foreign certification program, known as the Educational Commission for Foreign Veterinary Graduates (ECFVG), for the past 20 years but has yet to pass all of his exams. The ECFVG Program is an educational equivalency assessment certificate program offered through the American Veterinary Medical Association. Jordanovic failed the Basic and Clinical Sciences Examination five times between 2012 and 2015, the state alleged. Call 6 Investigates' Kara Kenney attempted to interview Jordanovic via phone, but he referred RTV6 to his attorney. The attorney did not respond to emails. Kenney caught up with Jordanovic outside the Pet Vaccination Clinic on West Washington Street. When asked about performing surgeries without a license, Jordanovic said, "I don't want to talk about it." State documents show Jordanovic performed Candy’s spay surgery while supervised by a licensed veterinarian, who was on the premises and checked on Candy several times, state records show. But the state questioned whether Jordanovic used the “appropriate standard of care” and challenged his extended enrollment in the foreign certification program. In February 2017, Jordanovic reached a settlement with the Indiana Board of Veterinary Medical Examiners in which he agreed to stop performing surgeries until he passes the foreign certification program. Under Indiana law, once an individual is enrolled in the ECFVG program, they are exempt from veterinary license requirements and are authorized to practice veterinary medicine as long as a licensed veterinarian is readily available on the premises. Jordanovic said he is not performing surgeries at the Pet Vaccination Clinic. “I don’t have to do any surgery,” he said. Jordanovic attended veterinary school at the University of Belgrade and obtained his doctoral degree in 1983. As Call 6 Investigates asked Jordanovic about Candy’s spay surgery and whether he used an appropriate standard of care, a clinic worker showed up and asked RTV6 to leave the property immediately or she would call the police. The clinic released a statement Monday morning to RTV6, indicating "Dr. BJ" plans to eventually stop practicing as a vet. "While Dr. Jordanovic is able to and has practiced veterinary medicine under Indiana law, he is phasing out of the practice of medicine and devoting his time and energy to running the Clinic,” read the clinic's statement. "The Clinic employs a number of veterinarians licensed to practice veterinary medicine in Indiana. The Clinic operates with at least one of the licensed veterinarians on-site to lead services." North and Chambers said the dogs survived the incidents at the Pet Vaccination Clinic, but some animal rescue groups refuse to take their animals to “Dr. BJ” and his clinic. Chambers said the state’s process doesn’t work. The Indiana Board of Veterinary Medical Examiners issued a cease and desist order in February 2018 against Sheryl Palmer of Indianapolis. Palmer practiced veterinary medicine as a veterinary technician for compensation, without having a valid license or vet tech certificate, records show. Southport Pet Hospital and its veterinarian Dr. Ronald Baumgart never checked to verify if Palmer was licensed or not. Baumgart told Call 6 Investigates in a phone call that he asked Palmer for her license, but she said she just moved and didn’t have immediate access to it. Records show the state veterinary board placed Baumgart on a year probation in February 2018. Sheryl Palmer is no longer working at Southport Pet Hospital. Palmer did not provide a comment to RTV6 despite numerous attempts via email, phone and stopping by her house. The Attorney General filed a cease and desist case in June 2018 against Amanda Jewell of Bloomington, accusing her of performing vaccinations for a free without a license. 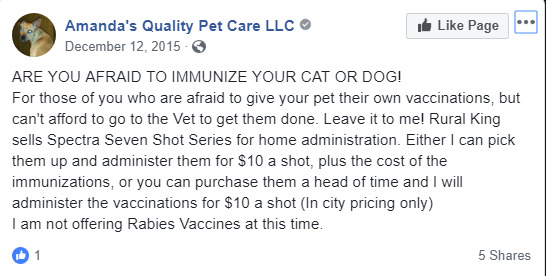 Amanda’s Quality Pet Care advertised the vaccination service on Facebook. Jewell agreed to speak with RTV6 and said she never actually performed any vaccinations by herself because no one expressed interest in the service. “I can see why it would be a concern, but at the time, it was just a sense of ignorance on my part,” Jewell said. “I'll admit I was ignorant. I would never ever intentionally jeopardize any animal or person in any way." Jewell does in-home pet sitting, grooming and bathing and says she has training with animals as a certified veterinary assistant. “I didn’t know that you can’t legally do vaccinations,” Jewell said. The Indiana Board of Veterinary Medical Examiners met on October 31 and issued a cease and desist order to Jewell, according to a spokeswoman with the Indiana Professional Licensing Agency. Veterinarians and attorney general's office say there's a good reason why the state cracks down on the practice of unlicensed veterinary medicine. RTV6 also spoke with Dr. Matt Cantrell, a veterinarian and president of the Indiana Veterinary Medical Association. For example, it can be dangerous to give a dog or cat a vaccine without the proper license and training. Dr. Cantrell said pet owners should take note if a facility’s services seem grossly underpriced compared to other clinics, or if the facility is dirty.